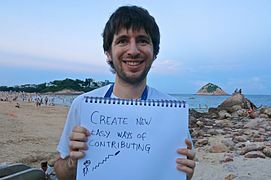 2.2 How can we make Wikipedia better? Here are some of the photos I took for Wiki Loves Monuments, a photo contest organized to add pictures of historic landmarks on Wikipedia. Most of my pictures so far are from Marin County, California, where I live. These are just sample photos from my multimedia collections. For more WLM pictures, check out this special page with all my photos for Wiki Loves Monuments. Enjoy these first pictures contributed as a volunteer. More to come! What you see on this page was copied from https://meta.wikimedia.org/wiki/User:Fabrice_Florin.